In his latest article, The Trump wars era (OpenDemocracy.net, 30 November 2017), Professor Paul Rogers, International Security Advisor at Open Democracy, outlines the terrifying augmentation of military force by the Trump administration. Because of its importance, we include it below in its entirety. “The U.S. has 8,892 forces in Iraq, 15,298 troops in Afghanistan and 1,720 in Syria, for a total of 25,910 troops serving in the three war zones as of Sept. 30, according to DoD. The figures were released to the public Nov. 17 as part of DoD’s quarterly count of active duty, Reserve, Guard and civilian personnel assigned by country by the Defense Manpower Data Center” (see Tara Copp, “26,000 troops total,” Military Times, 27 November 2017). Such indicators give only part of the picture. Another is a Pentagon request for $143 million to expand its operations at the Azraq base in the Jordanian desert, the largest single overseas financial commitment now being considered. This base has been key to operations in Syria and Iraq, and been used by other states including the Netherlands and Belgium. So just as the wars in Iraq and Syria are supposed to be winding down after ISIS’s much-vaunted defeat, the Pentagon wants to go the other way and prepare for yet more conflict in the region. A growth in overseas bases, such as a huge one for surveillance drones costing $100 million in Niger, fits the trend. All this must be seen in the perspective of the sixteen years of “war on terror”. Again, troop numbers are a signal if not the whole story. In 2007-08, at the height of George W Bush’s campaigns, close to 200,000 US troops were in Iraq and Afghanistan. Even as Barack Obama started to withdraw troops from Iraq, he was “surging” them in Afghanistan: an extra 30,000 troops by 2011 took the US total in that country to around 100,000. That short-term policy failed in its aim of forcing the Taliban to the negotiating table, and most troops had been withdrawn by the end of his second term in 2012. In parallel, Obama was moving rapidly towards “remote warfare“. This relied much more on strike-aircraft, armed-drones, and special forces – all involving far fewer “boots on the ground”. Destroy your opponents; forget the sixteen years of failed wars; do not try to understand where these enemies are coming from, and why they retain support. If these tenets guide Trump’s approach, Abdel Fattah al-Sisi’s regime has followed them in Egypt’s arena. Since al-Sisi became president after ousting Mohamed Morsi’s Muslim Brotherhood government in 2013, his forces have pursued a tough line against any kind of religious-based dissent. 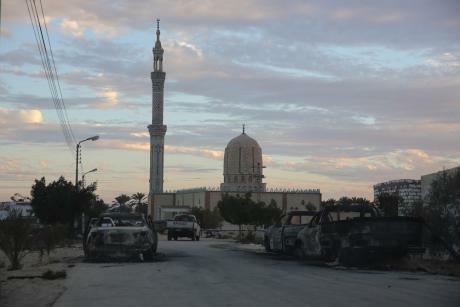 The Islamist-linked rebellion in northern Sinai was a prime target. The terrible attack on the Al-Rawda mosque in nothern Sinai on 24 November, which killed 305 people, is the latest incident in this escalating conflict. The immediate response to the massacre was air-raids by strike-aircraft, which the insurgents would have expected and taken precautions against. But the problems in Sinai go much deeper than al-Sisi’s policies, damaging as these are. This part of Egypt has long been neglected and marginalised. Its younger men are particularly angry that the oil and tourism industries bring local communities little or no benefit. Thus, the now dispersed ISIS leadership see al-Sisi’s Egypt in general and Sinai in particular as fertile ground. For the movement, Cairo’s policy of hardline suppression could hardly be better. An objective view of Sinai’s recent decades suggests that the chances of Sisi’s approach working are close to zero.